YORO, Gifu Prefecture--On Sept. 19, 2009, Hideki Matsui of the New York Yankees clubbed his 26th home run of the season, the most in franchise history for a designated hitter. He went on to the game's biggest stage and led the Bronx Bombers to a World Series championship, going 8-for-13 with three homers and eight RBIs. The 2009 World Series MVP can thank master craftsman Isokazu Kubota for a lot of those hits. Now, after almost five decades of making bats for great hitters on both sides of the Pacific, the 70-year-old Kubota will step down. At a Jan. 28 news conference, Kubota announced that he is getting too old for the trade, and that his company will have his successors carry forward his work. He plans to retire in April. Since around 1965, Kubota has manufactured baseball bats for professional players at Mizuno Technics Corp.’s factory here. 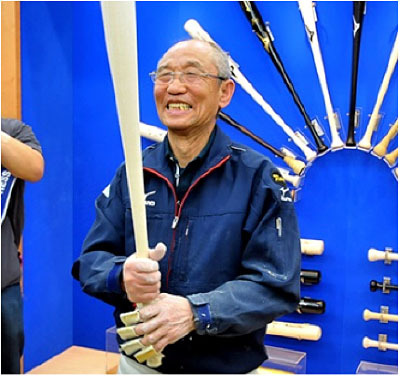 The skilled artisan has made hundreds of thousands of bats for ballplayers, including hit machines Hiromitsu Ochiai of the Lotte Orions and Pete Rose, Major League Baseball's all-time hits leader with 4,256. In 2003, he was named a “contemporary master craftsman” by the labor ministry. Kubota said one of his most memorable experiences was when Ochiai and the Hanshin Tigers' Randy Bass both won consecutive Triple Crowns in 1985 and 1986. “When they captured the titles, I was moved,” Kubota said. Matsui used Kubota-made bats for most of his 10 seasons with the Yomiuri Giants and 10 years in the majors. Kubota also had a hand in producing the bats for baseball superstar Ichiro, now with the Yankees. At the news conference, Matsui appeared in a video message expressing his appreciation for Kubota's craftsmanship. “(Kubota) satisfied my requests 100 percent for 20 years until my retirement,” said the slugger known as "Godzilla" for his prodigious power at the plate.